At Millpond Doodles, we are dedicated to breeding quality Miniature Goldendoodle & Petite Goldendoodle puppies for great family pets and personal companions. We pay special attention to temperament and personality while raising our miniature goldendoodles, and all of our dogs are home raised rather than in kennels. Our puppies are socialized daily with kids, cats and our other dogs, helping to raise friendly, trainable miniature and petite goldendoodles. Looking to take home you own petite or miniature goldendoodle? 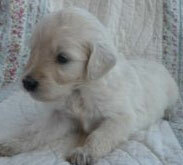 View our current and upcoming litters to learn more about our goldendoodle puppies for sale. (a) We love our small dogs from the time they are born and want to be a part of their life. (b) The Goldendoodle puppies are socialized to the fullest to adjust easily to their new homes. We give our pups the time and attention to give them the best start possible right from day one, until it's time to leave for their forever home at around 8 weeks. We are strong believers of crate training, and this method when used properly is an important tool to aid in housebreaking. Our pups are encouraged to do their "business" outside. They are dewormed, vet checked and have had their 1st shots. They leave with a puppy pack, which includes a small bag of food, a stuffed toy which carries the scent of the litter, so they wont get too lonely their first night, and a 4 year written health guarantee. We also provide a follow up service or support system for new owners with as much guidance that is required to keep everyone on-track with the new member of your family. Do you have any puppies for sale? How can I get one? At Millpond Doodles, we sell our petite & miniature goldendoodles to loving families and individuals. To reserve your puppy, view our puppy adoption procedure and follow the steps. You can also view our upcoming litters here: Petite and Mini Goldendoodle.